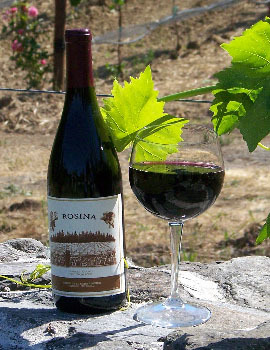 Rosina Vineyard is a family owned and operated vineyard and winery in Redcrest, California. We craft our wines from our own pinot noir grapes, grown here in southern Humboldt County. The marine fog in which the ancient redwoods thrive also makes this climate ideal for growing pinot grapes. It keeps temperatures cooler, and it also insulates at night, so we have no problems with frost. All of our vines are dry farmed and free of pesticides and herbicides.